Michael Payne moved to the western suburbs from his South Side home nearly five years ago, but he still remembers the drudgery of commuting into the Loop for his job as an office repairman—and the hour-long bus rides that he had to take to the closest Red Line stop before moving even an inch northward. These memories, coupled with a lifelong interest in trains, prompted Payne to work for 16 years on a proposal to improve public transit to the South Side: the Chicago Transit Authority (CTA) Gray Line L Route Project. Though neither Metra nor CTA are currently considering his plans, Payne, 63, has opened the way for other projects and has caught the eye of advocates for transit reform. His stint at a railroad company in the 1970s allowed him to plan, perfect, and lobby for the Gray Line, which would convert the two inner tracks of the Metra Electric District into L lines. Trains with new decals would run every 10 minutes instead of every hour, as they sometimes do now, and turnstiles and fare boxes would be installed at stations. Metra personnel would continue to staff the trains. Payne estimates that the project would cost $200 million, create 8,000 to 10,000 permanent jobs, and encompass 40 stops over 25 miles. In contrast, he said, Mayor Rahm Emanuel’s proposed Red Line extension would cost about $1.4 billion for three stops along five miles. The Gray Line was ranked first in a 2003 study of city public transit projects by the Chicagoland Transportation and Air Quality Commission. However, CTA found that Payne’s plan inadequately addresses South Side transportation needs that are better served by the Red Line extension, which would run up to Howard Street, while the Gray Line would stop at Millennium Park, according to CTA spokesperson Catherine Hosinski. Payne responded that passengers could transfer from the Gray Line to other CTA trains to go farther north. Hosinski also said that the Gray Line would not be able to run as frequently as Payne desired because the Metra tracks cannot be shared between trains as efficiently as CTA tracks. Payne claims that the real problem is tensions between Metra and CTA. “It’s completely, 100 percent political,” he said. The Chicago Department of Transportation (CDOT) is leaning toward the less ambitious Gold Line, whose designers were inspired by Payne’s work. “The Gray Line wasn’t the option the community was most interested in,” said Brenda McGruder, the coordinating planner at CDOT. 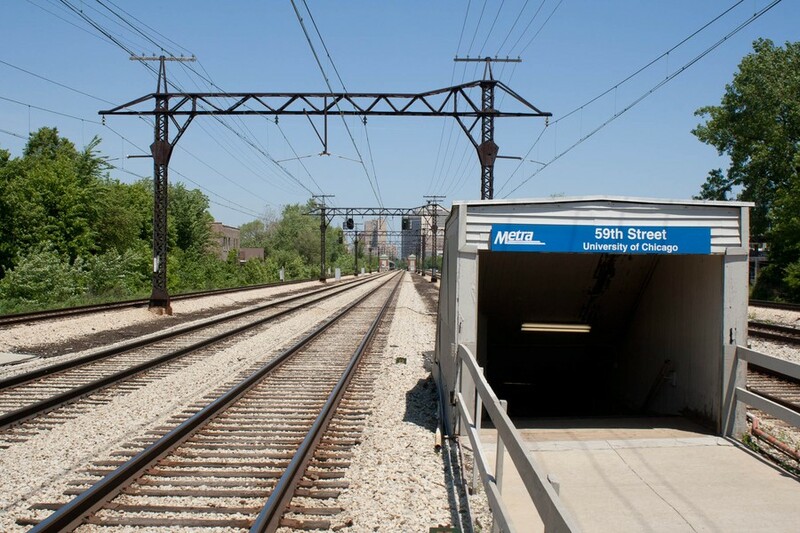 The Gold Line, spearheaded by Southsiders Organized for Unity and Liberation (SOUL), would convert only the Metra’s South Chicago branch, which runs along Lake Park Avenue. SOUL originally supported the more expansive Gray Line, but opted for a plan that seemed more feasible at the time. “We thought that was the most practical thing to do,” SOUL board member Linda Thisted said. SOUL, along with Fourth Ward Alderman Will Burns, has successfully lobbied for the introduction of a universal fare card for CTA and Metra systems that will take effect in 2015. Payne, who also anticipated fares as one of the largest hurdles in improving transportation, is grateful for SOUL’s work. “I never could have come up with that,” he said. While struggling to find support for the Gray Line, Payne was let go from his repairman job in 2006, leaving him homeless, spending many nights sleeping on the L for six months. After finding his current job at a B.P. station outside the city, he moved and bought a car. Yet Payne remains optimistic. Social security checks and a discount from a former employer have allowed Payne to print fliers that he plans to pass out at community meetings and on L stops.